Henderson guided GM through the automaker's 39-day bankruptcy in June and July after replacing the ousted Rick Wagoner in late March. 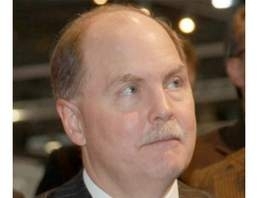 DETROIT -- General Motors Co.'s CEO Fritz Henderson abruptly resigned after just eight months on Tuesday as the company's board decided to chart another new course for the restructuring automaker. Henderson was asked by directors to step down at a meeting in Detroit, according to a person with direct knowledge of the matter. At a hastily called press conference, Chairman Ed Whitacre, 68, said he will become interim chief executive as an immediate search for a new CEO and president begins. Henderson's sudden departure underscored the tough oversight being exerted by a slate of new GM directors led by Whitacre and selected by the automaker's majority shareholder, the U.S. Treasury. Henderson, 51, became CEO in March after his predecessor, Rick Wagoner, was forced out by the Obama administration as part of a U.S. government-funded restructuring. The company, which hasn't posted an annual profit since 2004, is desperately trying to rebound from 2009's global sales collapse. "Fritz has done a remarkable job in leading the company through an unprecedented period of challenge and change," Whitacre said. "While momentum has been building over the past several months, all involved agree that changes needed to be made." Whitacre, a former AT&T chief executive, became chairman of GM in July as part of a new board vetted by the U.S. Treasury and intended to safeguard the government's $50 billion investment in the automaker. The plain-spoken Texan has said he knew nothing about the auto industry when he became chairman. He has surprised GM insiders by making unannounced plant visits and putting blunt questions to workers at all levels. The U.S. government has a majority stake in GM, but the Obama administration has repeatedly said that it is leaving oversight of the company to Whitacre and the board. Whitacre, who became the public face of GM in its first ad campaign after bankruptcy, appeared briefly before reporters at GM's headquarters in Detroit but did not take questions on why the board had chosen to part ways with Henderson. Whitacre does not have long-term intentions to remain CEO, GM spokesman Chris Preuss. “These things usually take months, not weeks, to find CEOs and execute this change,” he said. Preuss declined to specify what criteria GM will use in the search for a new CEO or if the company will seek one outside the industry. Whitacre has complained that pay restrictions imposed on GM have made it hard to hire external talent, but the board will likely look for an outsider who can better sell the vision of a revived GM, analysts and industry executives said. "Whitacre wants an outside CEO. He's looking for another Alan Mulally," said Logan Robinson, a longtime auto industry executive and professor at the University of Detroit Mercy School of Law. Meanwhile, GM's vice chairman and marketing chief, Bob Lutz, will step in for Henderson at a speech Henderson was due to give Wednesday at the Los Angeles auto show. Henderson, a career GM executive, had vowed when he became CEO to reform the slow-moving culture that contributed to the automaker's collapse. But GM's faltering efforts to sell off its laggard brands dominated his short tenure and tarnished his reputation as a dealmaker and raised questions about the company's strategy. First, Detroit-based dealership chain Penske Automotive Group pulled out of a deal that would have had it acquire GM's Saturn brand in late September. Saturn is now being shut down. Then last month, GM's board shifted course on a planned sale of the company's European Opel unit, rejecting a deal that Henderson had backed and helped broker. In the most recent setback, Swedish supercar builder Koenigsegg dropped a planned acquisition of GM's Saab brand. Last month, in statements that some read as an implicit rebuke of Henderson, Whitacre seemed to question the aggressive timetable for an initial public offering of GM stock that had been outlined by Henderson. "At the end of the day, it seems a little bit inevitable," said David Bitterman, managing director at Huron Consulting. "Obviously, Whitacre and Fritz didn't envision the new GM in the same way." GM's board said on Tuesday it would consider other potential deals to sell Saab over the next month but wind down its operations if it concluded that none could be reached. With Whitacre's shift to GM's interim CEO, all three U.S. automakers are now headed by outsiders to Detroit. Ford Motor Co. CEO Alan Mulally left Boeing Co in 2006. Chrysler is now run by Fiat S.p.A. CEO Sergio Marchionne. I want to assure all of our employees, dealers, suppliers, union partners and most of all, our customers, that GM's daily business operations will continue as normal. I remain more convinced than ever that our company is on the right path and that we will continue to be a leader in offering the worldwide buying public the highest quality, highest value cars and trucks. We now need to accelerate our progress toward that goal, which will also mean a return to profitability and repaying the American and Canadian tax payers as soon as possible. In closing, I want to once again thank Fritz Henderson for his years of leadership and service to General Motors; we're grateful for his many contributions. I look forward to working with the entire GM team as we now begin the next chapter of this great company.